This Lennon composition was written on the plane during the Beatles summer 1964 tour. The interesting Beatles fact here is that Lennon, clearly in his Dylan period, was once again confessing publicly through the song that he was insecure and needed help. Lennon thought this was one of his best early works. It was performed live on the TV show Shindig. 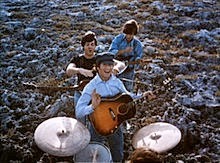 It was recorded August 14, 1964 and appeared on Beatles for Sale. Lennon sings lead vocal and plays acoustic guitar and harmonica. McCartney plays bass and provides backing vocal. Harrison plays lead guitar, and Starr plays drums.